Rock crystal is colorless quartz. Due to its clarity, rock crystal is the perfect canvas for a myriad of attractive mineral inclusions, including purple fluorite crystals, golden needles of rutile, metallic pyrite cubes, and many others. Refractive index, birefringence, optic character and optic figure. A bull's-eye optic figure is determinative for quartz; may also show Airy's spiral optic figure and Brazil-law twinning under crossed polarizing filters. 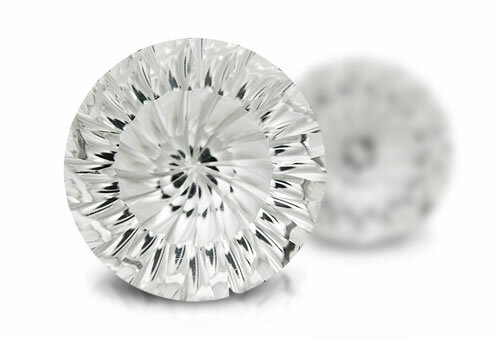 Colorless quartz with visible needle-like inclusions is a variety called "sagenitic." Stones with red hematite inclusions or "beetles-legs" may take a reddish appearance and be called "strawberry quartz." If colorless quartz contains golden blades of rutile it is often called "rutilated quartz. "Misnomers: Herkimer diamond, Arizona diamond, Arkansas diamond, Alaska diamond, Cornish diamond. Rhinestones get their name from the rock crystal from the Rhine river that was cut and polished and used as diamond imitations.